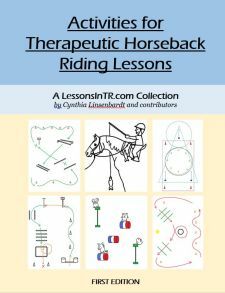 One of the goals of this blog is to help people pass certification to become a therapeutic riding instructor, and it is so neat to hear when this happens! A reader named Linda wrote me several weeks ago about how much this blog helped her prepare, then followed up by letting me know she passed her certification test last weekend! Congratulations, Linda!!! I am so happy for you, and so happy this blog is helping people. That totally makes my day! Linda also sent me her lesson plan from the certification teaching test, and said I could post it here. Thank you so much for sharing, I love the imagery you use! LESSON OBJECTIVE: Riders will demonstrate sitting trot on long side of arena 2x in each direction. Rider 1 mounts first so that she has extra time for her muscles to warm up. Regular croup mount from ramp. Rider 2 mounts next, regular croup from ramp. ­While Rider 2 mounts, Rider 1 walks with her leader, tuning in to the rhythm of the horse. 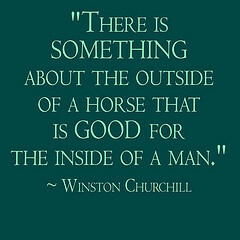 Ride around the outside of the arena so that riders get the feel and rhythm of the horse. Change directions. Check and correct basic body position. Breathe in and sit up tall, breathe out and relax your spine. What: Sitting Trot. Starting with slow trot to give our bodies a chance to get used to moving with the horse. This is easier at a slow trot. Why: The sitting trot will strengthen our core and help our balance. How: Review trot: shorten reins, squeeze legs and ask your horse to trot. Sitting: relax your body like we practiced in the warm up. Imagine you have glue in your saddle and sit quietly, moving with the horse. Where: Starting on the long sides of the arena. Safety Check: turn into center, whoa, put pretend glue in saddle. Point out it is not actual glue, because we would never attach riders to the saddle. On long sides of arena in both directions. Add corners for greater balance challenge and opportunity to strengthen. Ride at a relaxed walk. Feel the rhythm of the horse. As you practice more and get stronger, you will be able to sit at the trot like you do at the walk. You both made ​SPECIFIC​ progress today. (Tell them specifically how). Rider 1 first, as she mounted first. Regular croup to ground. Rider 2 next, regular croup to ground. One thing to add – when I did my own teaching test, I did the same thing and dismounted first the rider who had mounted first, because she had mounted first, and the evaluators told me I needed a better reason (such as she tires quicker, etc.) – so just be aware of that. Toe end, Linda writes: “I got really good feedback from the evaluators and I was really happy about it – especially because the role play on day before had been pretty rough! Guess it was good to get that out of the way.” So that’s you’re encouragement to do the role play at the OSWC – it definitely helps to have a practice round! It also goes to show you that even if your role play is pretty rough, you can ace the test! Once again, congratulations Linda, and thanks for sharing! Thanks for the great feedback. I’d love to know how it goes when you try it, and more about the yoga breathing you do in warm-up. Both students were able to follow instructions with the breathing and allowing the spine to relax at the exhale at the walk. We will continue to practice this tech at the sit trot. During warm up we discuss the value of balance and posture while riding and the horses ability to respond to our breathing, ( Some of my students have that “yeah right, teacher” look but are willing to participate). I have a 22 year old CP student and the yoga breathing has has given her a new way to communicate with her horse as she has such very limited body movement. She is able to practice the inhale, pause, exhale pause breath and the breath of fire , where the inhale is through the diaphram (sp) and then the exhale is an audible forced breath. We are experiencing significant improvement in posture and her confidence has increased as we reiterate how her horse is responding to her breaths.